This is a great introductory collection of the Southwestern Tree oils. Distilled from the needles, twigs & small branches, Corkbark Fir is an excellent oil for treating chest ailments with a spastic cough. It is a general tonic, strengthener and offers immune support. Makes a great perfume oil, added to uplifting blends. Energetically uplifting, helps to relieve anxiety and helps to relax & focus the mind. The aroma is a smooth, balsamic, fresh fir scent. Distilled from the needles, twigs & branches, Pinon has anti-inflammatory & anti-spasmodic properties. Use it in a diffuser to purify the air, in a pain relief blend, it is great in an inhaler due to its decongestant & mucolytic qualities. Energetically it expands awareness, it is grounding & protective, and assists with moving blockages in our energy system. It has a full coniferous aroma. 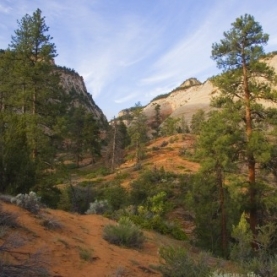 Distilled from the needles & small branches, Ponderosa pine is anti-bacterial, rubefacient & anti-inflammatory. A great oil for respiratory concerns, colds & flu. Energetically, Ponderosa moves energy, expands awareness, it is emotionally restorative. The aroma is a bit lighter than Pinon Pine. Distilled from the needles & twigs, Utah Juniper has decongestant, antiseptic, analgesic & anti-inflammatory properties. Energetically it assists in one’s connection to the Earth. It is emotionally restorative & uplifting, grounding yet expansive. A wonderful oil to add to a chest rub or in a steam when fighting colds, flus & sinus infections. Distilled from the needles & small branches, White Fir has anti-fungal, antioxidant, mucolytic & anti-inflammatory properties. Use for sinus & lung issues. Energetically, it helps to connect us to the 7th chakra, it is cleansing & protective, helps us to release negative patterning and helps to move physical & energetic blockages. This oil blends nicely with other conifers, citruses and oils high in oxides.